Inspired by the high-performance SLS AMG GT3 racecar, the fifth Black Series model utilizes the "AMG Lightweight Performance" to breed a compelling mix of striking design, superb performance and lightweight construction, resulting in a curb weight of only 3,417 pounds. To that svelte build, an AMG 6.3-liter V8 engine is added, generating a staggering output of 622 hp at 7,400 rpm. The Black Series will accelerate from zero to 60 mph in a heart-in-your-throat 3.5 seconds. Consequently the 2014 SLS AMG Black Series achieves a power/weight ratio of 5.49 lb/hp. Adding the coil-over AMG Adaptive Performance Suspension, AMG high-performance ceramic two-piece brake system and weight-optimized, forged AMG light-alloy wheels, sporting high performance tires, opens the road to a whole new level of performance in the pursuit of the true union between man and machine. It also includes an electronically controlled AMG rear-axle differential lock and the AMG SPEEDSHIFT DCT 7-speed sports transmission to produce rewarding shift and response times. An available AMG Aerodynamics package boosts the vehicle's handling and dynamics even further. "The new SLS AMG Black Series is a perfect study in the one hundred percent transfer of technology and engineering from motorsport to road. We have drawn inspiration from the worldwide success of the SLS AMG GT3 customer sport-racing car on both a conceptual and a technological level. Boasting numerous lightweight components and fascinating dynamics, our fifth Black Series model guarantees pure, unadulterated 'Driving Performance.' The SLS AMG Black Series is the ultimate choice for fast laps and a highly emotional experience," says Ola Källenius, Chairman of Mercedes-AMG GmbH. The new improved AMG 6.3-liter V8 engine’s output of 622 hp and 468 lb-ft of torque is synonymous with for thrilling performance, making the 2014 SLS AMG Black Series the most powerful AMG automobile with a combustion engine. Only the SLS AMG Electric Drive, producing 740 hp from a combination of a gasoline engine and electric motors, has more power. 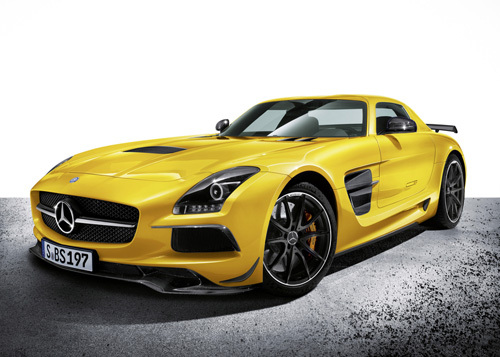 The 2014 SLS AMG Black Series, above and beyond its breathtaking acceleration, has a top speed of 196 mph. "Fans of high-performance super sports cars will be fascinated by its high-tech package. The basis for passionate performance and supreme driving dynamics is provided by numerous new developments in the engine, transmission, suspension and aerodynamics - also giving top priority to our "AMG Lightweight Performance" strategy. Outstanding efforts in the field of lightweight design have resulted in a curb weight of 3,417 pounds," noted Tobias Moers, Head of Total Vehicle Development and Member of the Board of Mercedes-AMG GmbH. The extra 39 horses, added to the previous 583 hp of the SLS AMG GT, are achieved by an entire suite of enhancements. The engine’s Red Line maximum has been increased to 8,000 from 7,200 rpm. The high-speed valve train has been revised with modified camshafts, adapted cam geometry and optimized bucket tappets that utilize a special coating normally reserved for racecars. The air duct intakes have been modified along with de-throttling and adaptation to suit the higher maximum speed of the engine. Also, engine mapping has been adapted to increase peak pressure at spark. In addition to all the above, engineers at Mercedes-AMG have optimized the crank assembly to maintain stability under racetrack demands. Oil bores have been modified in the crankshaft that uses new bearings. A refreshed oil pump is included along with high-strength fasteners added to the connecting rods. The entire cooling system for both the engine and transmission has been enhanced along with the engine mounts. A gas-filled strut braces the V8 engine to the body, eliminating unwanted load shifts during demanding racetrack competition. The hand-built AMG 6.3-liter V8 engine is fabricated at the AMG factory in Affalterbach, where the philosophy remains "one man, one engine." This high level of craftsmanship is confirmed by the black AMG engine badge bearing the engine builder’s signature, a hallmark of the Black Series. The naturally aspirated engine is placed behind the front axle, producing an invigorating sound befitting its thoroughbred pedigree, further augmented by the newly designed AMG sport exhaust system – for the first time made of titanium, with both center and rear mufflers, to create a more resounding and aesthetically pleasing sound. The switch from steel to titanium alone produced weight savings of nearly 10 pounds over its predecessor. The new system features fan-type exhaust manifolds that add even more to the car’s performance. The 2014 Mercedes-Benz SLS AMG Black Series is 154 pounds lighter than the SLS AMG, with the best power/weight ratio of all AMG Black Series vehicles to date. Among the world’s supercars, the figure of 5.49 lb/hp is highly competitive thanks to the application of the "AMG Lightweight Performance." Body elements including the hood, the panel behind the bucket seats, underbody braces and torque tube are made of carbon fiber reinforced plastic (CFRP). Compared to the 58.6-pound counterpart with a sand-cast aluminum housing it replaces, the carbon-fiber torque tube weighs just 29.3 pounds. The CFRP drive shaft weighs only 10.4 pounds and manages power from the engine and dual-clutch transmission using a transaxle principle, flange-mounted to the rear axle. CFRP components have also replaced many parts of the aluminum frame, while a lithium-ion battery replaces the conventional one, saving another 17.6 pounds. The AMG SPEEDSHIFT DCT 7-speed sports transmission is placed 0.4 inches closer to the pavement to lower the center of gravity and braced against the body by gas-filled struts to prevent stress cycling. The dual-clutch transmission comes with four selectable drive modes (C, S, S+ and M). Sport plus and Manual provide aggressive performance along with an increase in shift speed. The transmission responds with celerity to any input from the driver. Even more exhilarating is an automatic rev-matching function during downshifting. The Black Series power jumps upon shifting are more pronounced and striking thanks to the titanium exhaust system. A new on-the-fly M mode is engaged by pressing the up or down paddle shifter once. Thus, the driver may experience the dynamic performance of manual shifting in all the driving modes, with automatic shifting as well, allowing undivided devotion to the vehicle's performance. A new electronic rear-axle differential lock with a shorter ratio replaces its mechanical cousin. Integrated into the housing, this system utilizes a variable locking effect under both acceleration and deceleration. Further the electronics are more responsive, providing rear wheel traction under all road conditions, also benefitting safety. The reduced vehicle yaw around the vertical axis provides stabilization when changing lane at high speeds. The standard 3-stage ESP system provides two functions – ESP ON and ESP SPORT Handling Mode tuned to the rear axle differential lock. The system can also be turned off while a RACE START function works with the differential lock to provide crisp traction accelerating from a standing start. The 2014 SLS AMG Black Series also features a new chassis and suspension, while the aluminum double wishbones all around remain unchanged, virtually every other part has been refined to enhance track performance. The Adaptive Performance Suspension provides a tauter base setup and electronically controlled two-stage damping in Sport and Sport Plus modes to suit personal driving style. Coil-over springs allow for adjustment to individual racetrack setups. The new Black Series is 42% more rigid for greater stability in turns. The track width has been boosted 0.8 and 0.9 inches on the front and rear axles respectively for a stronger grip. New wheel mounts and stabilizer tuning in front also add to road grip and reduced body roll in fast cornering. Lightweight 10-spoke forged alloy wheels provide optimum strength and are painted matte black with a high-gloss finish, producing weight saving of 8.8 pounds. They sport newly developed Michelin Pilot Sport Cup 2 sports tires that works with the revised characteristics of the speed-sensitive steering for precise maneuvering and outstanding control. The Mercedes-Benz 2014 SLS AMG Black Series will be at US dealerships by next summer.